With temperatures more like March than January, the Hell's Kitchen Flea is expecting a busy weekend. Our vintage vinyl, clothing, and antique vendors will be joined by up-and-coming jewelry designers from all over the city. Hope you can join us for a weekend when we've been assured the weather will be perfect for an outdoor shopping experience! Make an Outing of It by Adding Brunch or Breakfast at One of Hell's Kitchen's Finest! Brunch is one of the best indulgences New York has to offer, but the recipe for a perfect weekend is planning brunch around a shopping expedition! Neighborhood restaurants famous for their breakfast and bunch let our shoppers make their visits to the flea even more memorable by adding a great meal to the mix. If you're walking from points east of the HKFM, you'll find a wonderful Italian breakfast on Sundays starting at 8 at Non Solo Piada at 302 W 37th St, just a minute from the market. And if you're coming from the west, Friedman's at 450 10th Ave (at 35th) is a favorite for brunch served all day, from 8 -4, on both Saturday and Sunday. With gluten-free pancakes and specialty bellinis, Friedman's has earned its reputation as one of Hell's Kitchen's best spots for healthy comfort food. And for those who want to hone in directly on the market at 39th and NInth Avenue, there's HK, the Hell's Kitchen landmark where you can get a fabulous brunch all day just steps from some of the market's most famous jewelry designers. C'mon! Make a day of it! Visit Hell's Kitchen for a little shopping and a great brunch too! Don't forget - On Saturday, February 25th the Hell's Kitchen Flea will host a mobile adoption event with New York's Animal Care Centers. You can meet NY's finest pets, already pre-screened, starting at noon. Stop by and see if any one of them might be willing to adopt you, and change your life forever! It's a Warm Weekend in Manhattan - See You at the Hell's Kitchen Flea! The weather forecast is in-- and this weekend is going to be perfect for an outing to the Hell's Kitchen Flea! 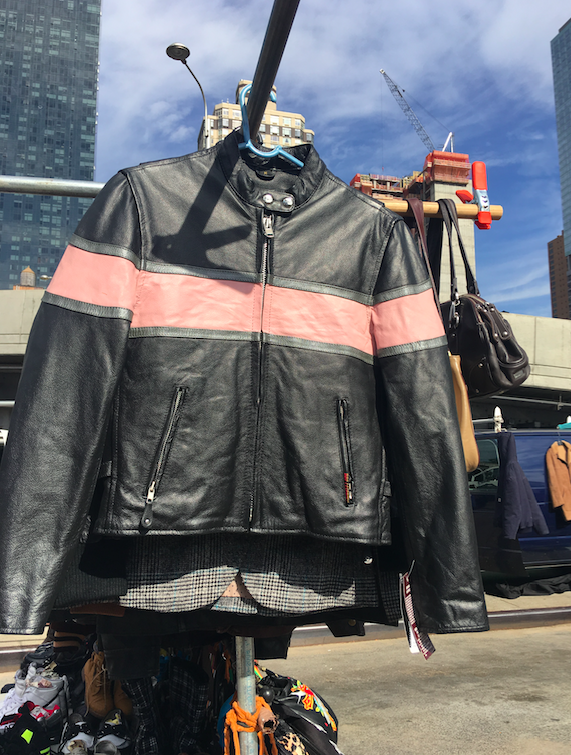 With temperatures more common for March than January, our vendors will be ready to provide you with the quintessential New York Uniform: A leather jacket you can own for a fraction of what you'd pay in Soho (and a story to go along with it!). Serious shoppers will also be interested in political memorabilia, reminding us of America's colorful political history--on the year's most political weekend. The Dogs and Cats are Coming! 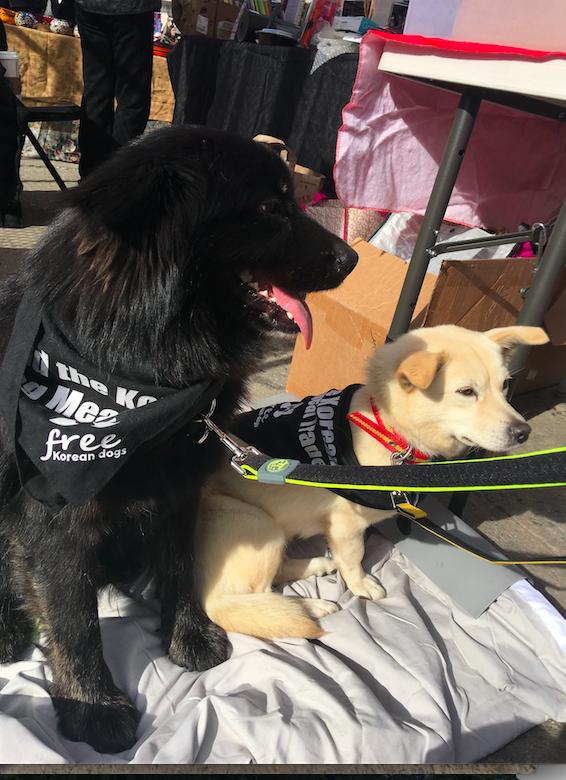 Mark you Calendars for February 25 when New York's Animal Care Centers will bring their mobile adoption unit to the Hell's Kitchen Flea from 12-5. All the animals will be pr-qualified as wonderful companions, so make sure you're planning to stop by and see of one of New York's most spectacular pets will consider becoming your BFF for Life!! See you at the Flea! And finally, we reported with great sadness in early December the passing of a great local artist, friend to the Hell's Kitchen Flea and Hell's Kitchen Foundation grant winner Judy Negron. In memory of Judy, who had exhibited her work all over the world, a gallery show and exhibition of her work has been set for Thursday, January 26, 6-8 pm, at the Jadite Gallery at 660 Tenth Avenue. We'll be open bright and early on Saturday morning and hope to see you at the Hell's Kitchen Flea for the last market of 2016, celebrating the conclusion of a great year marked by more vendors, more shoppers, and more live events than at any time in recent memory. This year we launched a series of exciting events to make the market experience even more special for vendors and shoppers alike. In early fall, the market welcomed the famed printmakers of Big Ink, who brought a dozen nationally known printmakers to Hell's Kitchen to demonstrate their unique art on one of the art world's biggest printing presses. On Halloween weekend, the world famous Maniac Pumpkin Carvers provided an unforgettable demonstration, drawing a large crowd as they transformed a simple pumpkin into a stunning likeness of the Hell's Kitchen Flea Market devil before our eyes. Visitors to the market were also fascinated by the mosaic-making demonstration of local artist Judy Negron, whose work was known to art lovers locally and around the world. Later in the year, the Hell's Kitchen community was saddened to learn of Judy's passing and we will miss her. With a dynamic new manager, the Hell's Kitchen Flea attracted dozens of new vendors and scores more shoppers from the New York area--as well as visitors from more than 30 countries. The market launched new vendor services and welcomed many unique new sellers from all over the world. 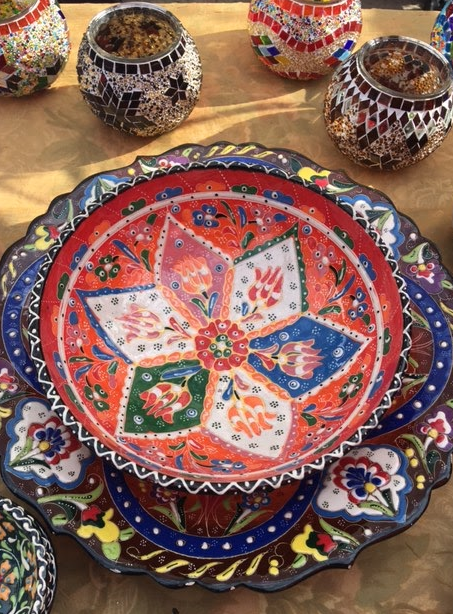 Shoppers discovered Turkish ceramics, Indian textiles, and Kenyan carving, in addition to the well-known, handcrafted jewelry and the leather jackets that have drawn crowds to the market for years. Treasure hunters have never found so many unexpected treasures as the flea had to offer this year. In 2017 we hope to bring you even more opportunities to enjoy a trip to Hell's Kitchen. Wishing everyone in the Hell's Kitchen Community a wonderful, healthy New Year! And in 2017, we hope to see you at the Flea! There's only one place in Manhattan where you can wrap up your holiday shopping in one easy trip, without experiencing even a little of the dreaded stress and sticker shock you've come to expect from a shopping expedition this time of year: The Hell's Kitchen Flea Market. Though the weather is supposed to be chilly on Saturday and warm on Sunday, our vendors will be here with the most unique gifts in the city. Join us this weekend to wrap up your holiday shopping in one easy trip. The Gifting Season is Upon Us! More than any time of year, the holiday season is the time when shoppers from around the city--and frequently from around the world--visit the Hell's Kitchen Flea in search of unique gifts for the best prices in Manhattan. This year we have more vendors and gift ideas then ever before! 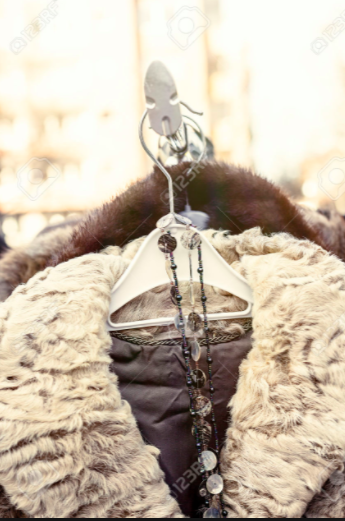 Where else on this island of astronomical prices can you find a leather jacket fit for a rocker or a vintage ensemble for the fashionista on your list for around fifty bucks? 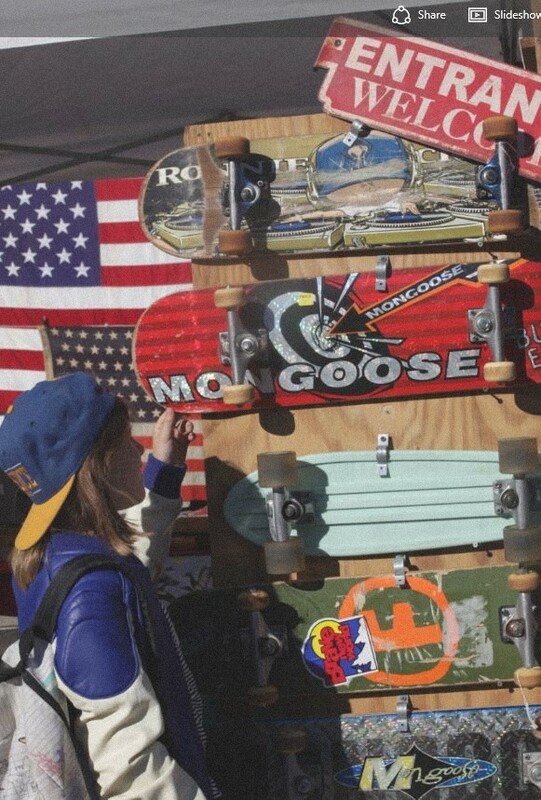 What about classic skateboards for the little daredevils on our list? It's all at the Hell's Kitchen Flea, of course. Last weekend we met shoppers who were already looking for holiday gifts for teachers. And we had plenty of great ideas for them. Let's start with jewelry designer Dawn Exton's original jewelry designs, including gorgeous one-of-kind pendants from her original industrial jewelry collection. Dawn sells beautiful, affordable, and unique art pieces that might just be the perfect solution for those who want to show teachers just how much they are appreciated. We've met lots of shoppers looking for host and hostess gifts as holiday parties approach. And we have great solutions at the flea. Even when you don't know your hostess' decor, there's a great variety of fun and functional gifts, like the lovely handmade Kenyan tote bags we found for a song or gorgeous handcrafted bowls from Turkey. And with so many music aficionados returning to their vinyl roots, a vintage record album is very often a perfect, highly personal, and much treasured gift, suitable for both playing and framing! Tourists visiting the market often tell us they are seeking gifts for family and friends back home. What could be a better memento of New York than an original abstract painting of 42nd Street? No matter how daunting your gift list looks this holiday season, start at the Hell's Kitchen Flea and you'll find incredible gift ideas at wonderful prices. Happy Holidays and Happy Shopping! There's nothing better after a big dinner than a refreshing walk through Manhattan, so plan to visit us at the Hell's Kitchen Flea Market this weekend for a little post-holiday treasure hunting. Recent holiday gift surveys have found that teens and 'weens love nothing better than a good clothes haul. 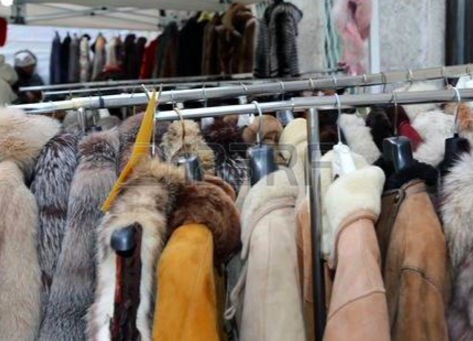 So if you've got some fashionistas on your shopping list, make sure to hit the flea before the holidays! We're the only place we know of in the metro area where you can score a fabulous vintage ensemble complete with gorgeous leather rocker jacket for under $100! And of course, remember that original jewelry designs are more affordable at the Hell's Kitchen Flea than anywhere else in New York! Resident jewelry designers and artisans like Dawn Exton will be at the HKFM every weekend for your holiday shopping needs. For teacher gifts, souvenirs, and of course for all the special loves on you holiday shopping list, a one-of-a-kind hand-crafted piece of jewelry is always a great choice! Thanks to everyone who made our dog adoption event such a barking great success! All the dogs were adopted and we'll have more soon. 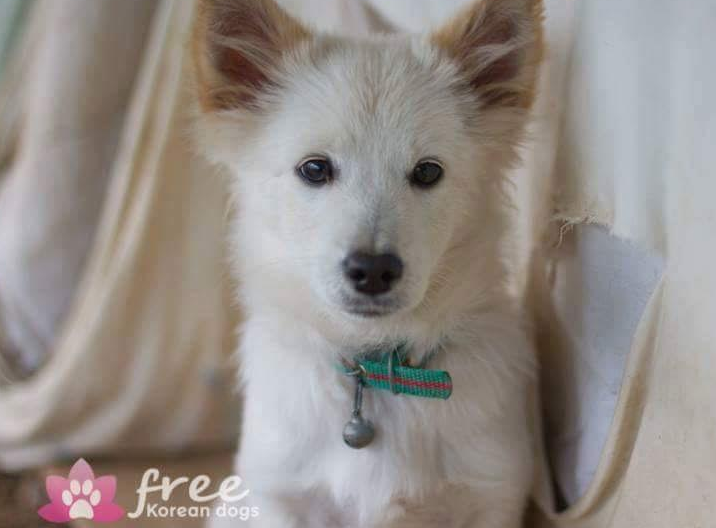 New Yorkers, always known for their generosity of spirit, really came through for the Korean dog adoption group--and we're all so grateful. Wishing you a wonderful Thanksgiving and hope to see you at the Flea on the weekend!!! You won't believe who's coming to the Hell's Kitchen Flea Market this weekend! Polar Bear Jindo mix (4 months-male) 6lbs, Bean Jindo mix (4 months-female) & Boebae (6 years old-female) Jack Rusell Terrier mix. 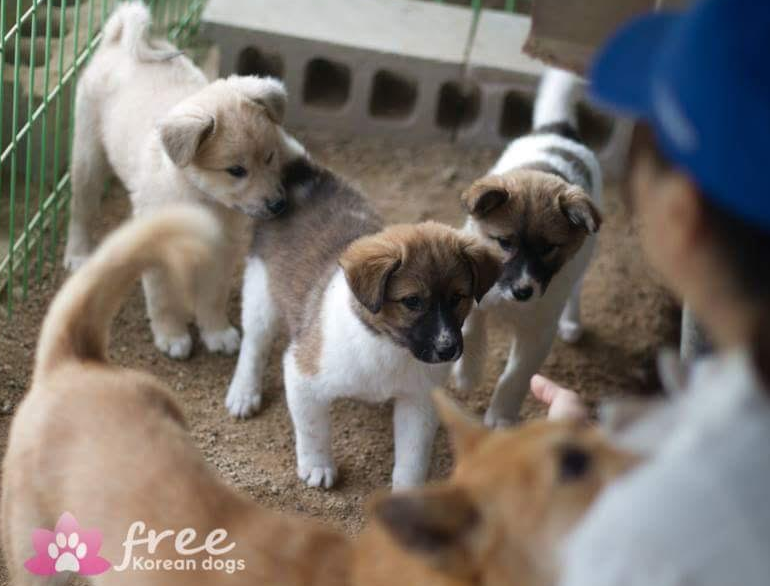 These huggable little creatures will all be up for adoption this weekend as part of the Korean dogs adoption program. You can learn more about the program on our Facebook page. You'll find them at the middle of the market, and their guardian angel, Gina, will be there to answer any questions you might have. Along with these littles, shoppers will find items from Better World Goods, Marquet, Jeweled Dripped, and Preen Pets a wonderful source for all natural dog treats, chicken strips and jerky made in USA. Better World Goods will be selling gorgeous items to support the puppy rescue work, including gemstone wraps and healing crystal pendants. And it's all for a doggone good cause! For those with a political hangover, there are plenty of collectables from years gone by that remind us that even seismic shifts on the political landscape don't last forever. And if you're in need of comic relief, we have that too, especially for fans of vintage comic books, for shoppers of all ages. And for our youngest, or at least our most daring visitors, there are the one-of-kind skateboards, including rare and difficult-to-find models. We're going to be in for a gorgeous weekend! See you at the HKFM! 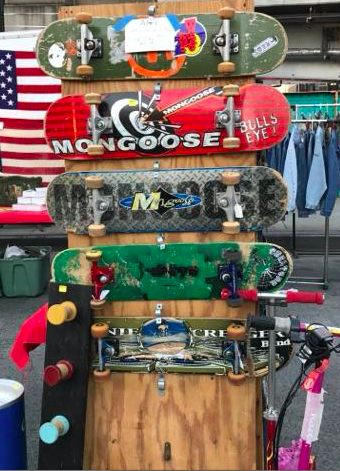 A lot happened this past weekend at the Hell's Kitchen Flea Market. The Maniac Pumpkin Carvers carved pumpkins, there was a dog adoption event, and many vendors and customers joined us. There were tourists from all over the world who found leather goods and vintage souvenirs. It was such a success that we are hoping to have more dog adoption opportunities and other events in the future. This upcoming weekend, we are gearing up for the holiday season. Our vendors have some great surprises in store for shoppers. Dawn Exton, a famous jeweler, is designing new pieces from her industrial and gem collections. She will bring all-new pieces to the flea each weekend for the duration of the holiday season. We are putting together a Hell's Kitchen Flea Holiday Gift Guide. It will feature unique gifts shoppers can find this season at our flea. 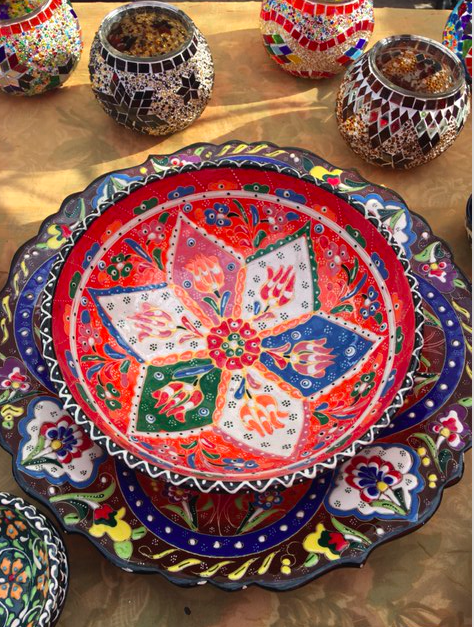 They will include stunning, handmade textiles from India and beautiful, hand-painted dinnerware, and lamps. 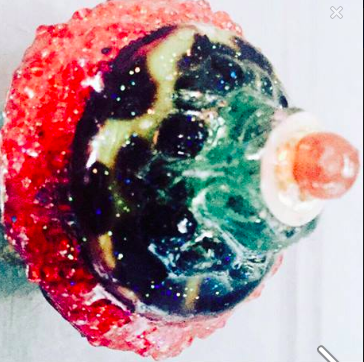 Our vendors also have unique "earthquake balls" from Turkey. These “balls” will bring their owners good luck. Reminder: our flea markets will be open Thanksgiving Weekend, Christmas Eve, Christmas Day, New Years Eve, and New Years Day. Don't forget about the Hell's Kitchen Foundation! The deadline for local artists to submit entries is coming up. The next round of Hell's Kitchen Foundation grants are due December 2nd. Please visit our website for more details. If you know a visual artist living around Hell’s Kitchen Flea, please encourage them to apply. The Hell’s Kitchen Foundation is very proud of our recent winners. Jessica Maffia and Judy Negron continue to make and exhibit locally. We are proud to have supported our community. Our goal is to support and celebrate artists in the neighborhood and to help ensure that the rich tradition of the arts on the West Side. The Maniac Pumpkin Carvers will be visiting Hell’s Kitchen Flea Market. They will be at the market on Saturday the 29th of October starting at 11 AM. This is a great, family-friendly event, and as always, it's FREE. See you on Saturday! It's a wonderful year when Halloween falls on a Monday! In New York City, that traditionally means New Yorkers set aside an entire weekend for enchanted revelry of all kinds. That means Hell's Kitchen Flea Market is where New Yorkers will kick off the weekend! Please make sure to join us at 11AM on Saturday morning at the flea. There will be a demonstration of pumpkin carving by the Maniac Pumpkin Carvers. They are known worldwide for having perfected the art of pumpkin carving. Even if you can't make the demo, come visit us during the weekend to see these memorable sculptures! Maniac Pumpkin Carvers was founded by Marc Evan (@marcmaniac) and Chris Soria (@chrissoria). They have been collaborating creatively for over 20 years. Every year in high school, Marc and Chris spent weeks transforming a section of the school into a series of delightfully terrifying haunted houses. Then, while both studied at Parsons School of Design, the duo rekindled their love for pumpkin carving and decided to make a career out of it. Maniac Pumpkin Carvers was formed with the mission of creating the best pumpkin artwork available. What started in a basement apartment has now grown to a full creative studio of talented artists and pumpkin carvers. After experimenting and developing their own techniques, Marc and Chris soon began to push the boundaries of basic pumpkin carving. Word of mouth spread to the biggest names in New York, including the New York Yankees, Food Network, and Martha Stewart. Their art has even been displayed at The Museum of Modern Art, the Whitney Museum, Yankee Stadium. Other appearances include Good Morning America, Rachael Ray, The Kitchen, The Chew, Wired, Popular Mechanics, Yahoo News, CNN, and more. They even have been the winners of Food Network's Halloween Wars. Shout-out to HKF Grantee Jessica Maffia! Hell’s Kitchen Foundation 2016 grant winner Jessica Maffia is exhibiting at the Accessible Art Fair New York at the National Arts Club Nov. 1–25. Learn more at:mvvoart.com. You can follow Jessica on Instagram as on Instagram as @jessicamaffia. The foundation is the community sponsor of Hell’s Kitchen Flea Market and awards grants to visual artists residing in Hell’s Kitchen. Local visual arts are encouraged to visit the Website to apply for the next round of grants, which closes on Dec. 2. This weekend, renowned artists and printmakers from all over the country will take part in BIG INK’s large scale woodcut, printing demonstration. It will be located at the Hell’s Kitchen Flea Market, from 10AM – 5PM on both Saturday and Sunday. The rain or shine event is an all-out extravaganza at the Flea Market. The Flea is located on West 39th Street between 9th and 10th Avenues. Thirteen highly skilled printmakers will travel from Manhattan, Brooklyn, and as far as Washington, D.C., Ohio, and Texas. They will contributing carved woodblocks to be printed on throughout the day. BIG INK's staff of volunteers will be there to see the production happen on the giant printing press. 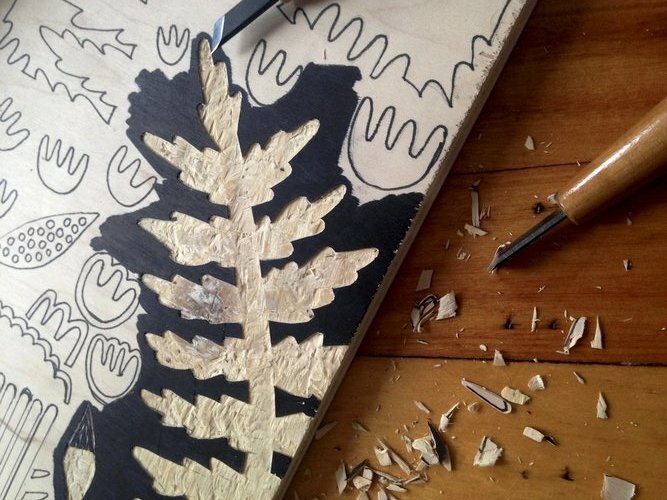 Woodcutting is a printing process that involves carving an image onto a flat, wood surface. It is a very, very old type of artform. The carved wood areas that display “white” or highlights are cut away using a chisel. The top, original surface of the wood remains “black”. This surface level of the wood is then covered by a paint roller with high quality ink. The wood is pressed onto paper, which transfers the ink. The final result is a lovely finished print. P.S. Do not forget to mark your calendars! The Maniac Pumpkin Carvers will be with us next weekend at the Flea. They are New York’s nationally recognized pumpkin sculptors! The carving will start at 11AM. See you at the Hell’s Kitchen Flea Market! Witness Big Ink's one-of-a-kind giant mobile press in action as they demonstrate large scale woodcut printing to the public from 10 am – 5 pm. This event will be held during Hell's Kitchen Flea Market. Come check them out on October 22nd and 23rd. Big Ink will be debuting their mobile 48” x 96” printmaking press in NYC. View many print makers from Manhattan to Brooklyn and as far as Ohio and Texas. They will be printed throughout the day by BIG INK's staff of volunteers. Big Ink organizes print related programming for museums, art festivals, as well as local and nationally recognized print studios. This event is sponsored by the Manhattan Graphics Center, a studio that provides an accessible environment for the learning and practice of fine art printmaking. FYI! This event is rain or shine! It is an all-out extravaganza at the Hell's Kitchen Flea Market. You don’t want to miss it! And then… there is the grand finale right before Halloween! The Maniac Pumpkin Carvers will also be visiting Hell’s Kitchen Flea Market. They will be at the market on Saturday the 29th of October. Fall is here! Hell's Kitchen Flea Market has nearly doubled in size since the end of summer! In the past few weeks, we welcomed close to a dozen new vendors. Last weekend, shoppers at the Hell's Kitchen Flea found new vendors like local artist David Pringle, who brought original art. He was selling hand-crafted wallpaper, handmade crystal finials, and an unforgettable feathered evening clutch. The clutch caught the eye of New York's premiere expert on flea market treasure and author of Markets of New York: Karen Seiger. As we gear up for fall events and the holiday season, shoppers from the neighborhood have joined treasure hunters from around the world. Skull rings, skateboards, and screen printed tees attracted one little shopper. 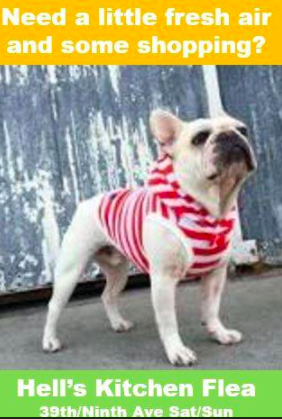 Their treasure hunting was only interrupted long enough to greet Vincent the bulldog. Also, for first time ever, the HK Flea held an artist demonstration. 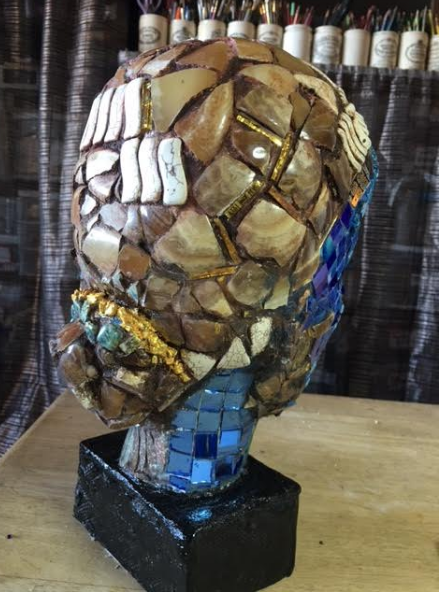 Judy Negron is Hell's Kitchen's renowned mosaic artist and recent winner of a Hell's Kitchen Foundation Visual Arts grant. She gave a demonstration of her art last Sunday. This marked the first in our occasional series of events showcasing local artists. On October 22/23, the world famous print-makers, Big Ink will bring their uniquely gigantic printing press to demonstrate the art of fine print making. Halloween Eve, Saturday, October 29th, the Flea will welcome the Maniac Pumpkin Carvers. They transform ordinary-looking squash into striking likenesses of Michael Jackson and more. Join us! Don't forget to LIKE us on Facebook and Like Big Ink and Maniac Pumpkin Carvers too! Vinyl enthusiasts know there is a huge selection of vinyl at multiple stalls at the flea market. You can find vintage records such as The Beatles, Prince, Michael Jackson, Rod Stewart, Alice Cooper, and more. People said MP3s would take over the music world, but it seems records are here to stay. You can also go even farther back in time and purchase an authentic Victrola or 78 records. Street style in Manhattan is nothing without Hell’s Kitchen Flea Market. There is vintage and new items. You can find a new, embellished French Connection dress that costs $300, but at the flea it is only $30! There are a ton of vintage fur coats, army uniforms, leather jackets, vintage dresses, petticoats, button-down shirts as well. There is also clothing from many parts of the world. It would not be a flea market with the wonderful collection of jewelry. There is vintage silver pieces that are a steal, handmade jewelry from local artisans in New York City, beaded necklaces from other countries, antique pins, rings, bracelets, cufflinks, and more. Some vendors sell lapel pins, which are huge right now. For accessories, there are purses, shoes (including spiked platforms! ), masks, army bags, vintage designer handbags, vintage glasses, and many other reasonably priced items. There are even old fire hats to get ready for Halloween. Hell’s Kitchen Flea Market has many local artists that have booths. They also have a grant program you should check out! Anyways, not only is there new art you could buy at a reasonable price… there is vintage and antique art too! There are vintage lithographic prints, screen prints, band posters, sculptures, paintings, and more! Interior designers come to the flea market to find inspiration. Vintage home décor is trending in restaurants, apartments, coffee shops, and other places in New York City. 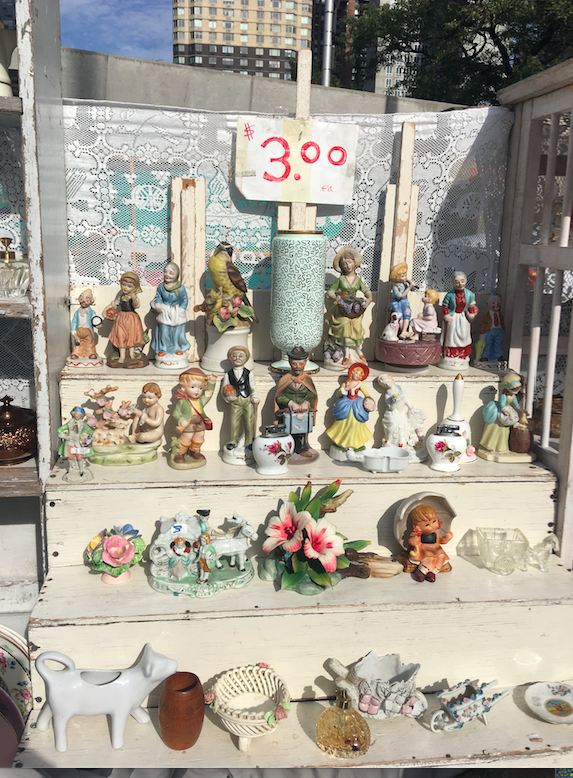 There are vintage instruments, small pieces of furniture, old school telephones, retro kitchen goods, silverware, vintage bottles and boxes, antique cameras, cigar boxes, retro toys, and many other items for sale. For many locals, leaving New York City is very expensive. The cool thing is New York City is a global hub. We have multiple vendors who sell items from many parts of the world. You can purchase items from Nepal, Africa, Middle East, Central America, and many other places. There are dyed fabrics, glassworks, sculptures, artworks, purses, ceramics, beads, jewelry from all over the world. The past weekend at the market was busier than ever. A dozen new vendors and lots of shoppers visited from around town and the world. Also, Sunday shoppers were treated to a demonstration of mosaics by Hell's Kitchen Foundation grant recipient and local artist, Judy Negron. 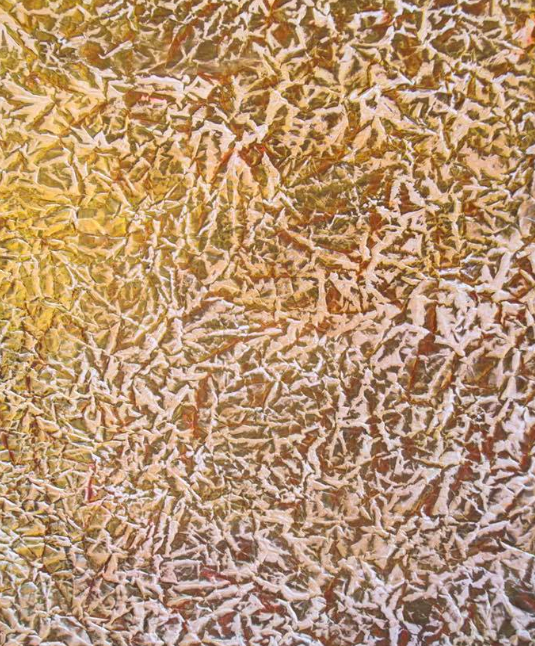 Judy is a mosaic artist, etcher, and painter. She has exhibited nationally and internationally in: la Main D'Or, Paris, Assisi, Italy, Cadaques, Spain, Museum of Modern Art Wales. In the U.S.; NYU Gallery, Kathryn Markel Gallery, Prince Street Invitational, Jadite Gallery. Our vendors were out in force and Sunday was a particularly busy day. There were hand-painted shirts from our favorite Tibetan jewelry stall and skull rings that are just in time for Halloween. We also met new vendor/local artist David Pringle. David’s table was popular with customers. He sold handmade glass finials and hand crafted wallpaper. Come join us this fall and meet new vendors! 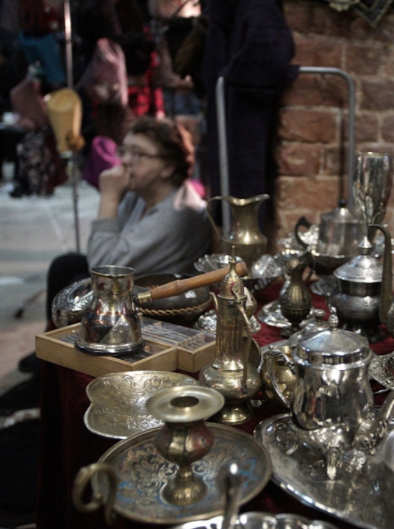 Last weekend, Hell's Kitchen Flea Market welcomed many new vendors and artisans. This included a demonstration from local mosaic artist Judy Negron who recently won a visual arts grant from The Hell's Kitchen Foundation. Judy showed her mosaic techniques to flea market customers on Sunday from 12-2PM. In fact, bases for Judy’s sculptures were purchased from Hell’s Kitchen Flea Market. 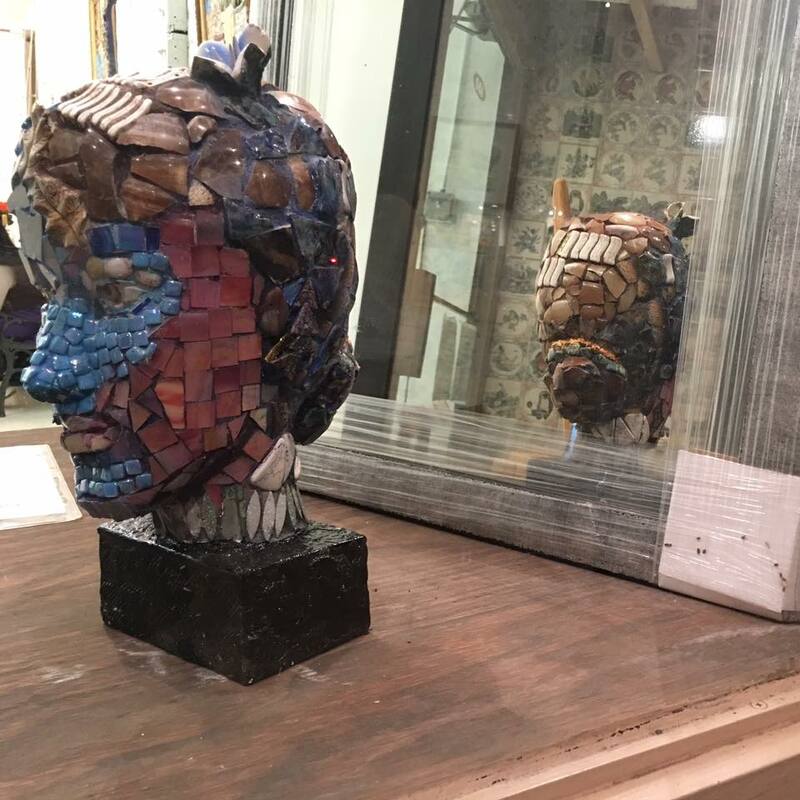 For example, the bases of the works “Fish out of Water, ($1600) and the head bust “She”, ($2000) were found at the flea market. The bases for “The Walkers” ($1800 for the set or $400 each) are also some examples. These works of art, created by Judy Negron, can be seen at the Judite Gallery on 660 Tenth Avenue between 46th and 47th. The show is on until this Saturday. The hours are 11-6. Judy is a mosaic artist, etcher, and painter (sometimes combining all three techniques in one work). She has exhibited nationally and internationally. Some exhibitions include; la Main D'Or, Paris, Assisi, Italy, Cadaques, Spain, Museum of Modern Art Wales. In the U.S.; NYU Gallery, Kathryn Markel Gallery, Prince Street Invitational, Jadite Gallery. Her work is included in The Museum of Modern Art collection, the collection of Deepak Chopra, La Sirene restaurant, Taureau Restaurant, The Wine Escape, and many other private collections. A commissioned piece: Two Cats, can be seen on the facade of 447 West 44th Street. The Hell’s Kitchen Flea Market is located on 39th St. between Ninth and Tenth Avenues, and is open from 9-5 every Saturday and Sunday. Admission is free.